If you’re coming from Microsoft and you’re new to Nimble, allow us to introduce ourselves! We are a #1 rated Social Sales & Marketing CRM that works great within your Office workflow. At Nimble, we’re dead-set on solving the problem that everyone faces: your flooded inbox and your endless list of follow-ups. Our Nimble add-in for Outlook gives you insights about your contacts alongside your inbox. Why does this matter? It matters because we surface social business details about your contacts and companies to help you engage in an effective and informed manner. Who can use the Add-in? How does the Nimble Add-in work with Outlook? 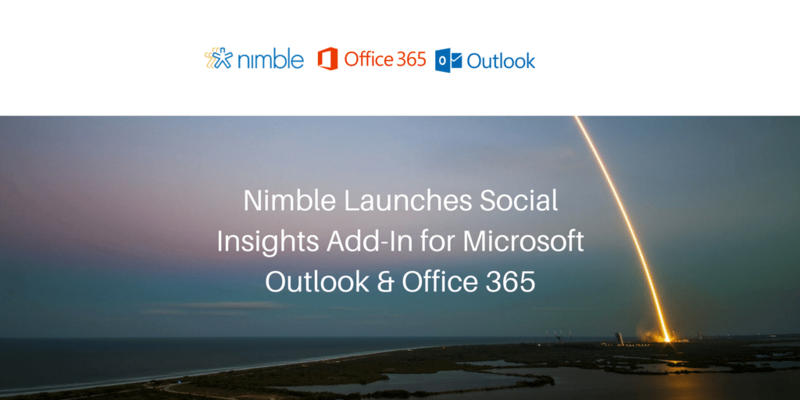 The Nimble Add-in for Outlook delivers comprehensive profiles of contacts in or outside of your social networks with information to help you grow your relationships in an authentic and meaningful way. Nimble will surface social profiles from a variety of social networks to help you see someone’s job title, company, location, revenue, Twitter stream, and much more. If you have an existing Nimble account or trial, you can also view and update records in your CRM without interrupting your email workflow.